I normally do not obsess over fabric. After all, my sewing skills are quite minimal (and I do mean quite minimal!). For whatever reason though, I just love Amy Butler's French Wallpaper Duck Egg Fabric. I don't know if it is the bold color combination of reds and blues or the pattern or perhaps both, but I have been a bit consumed by its loveliness lately. I got this gorgeous handmade coin purse in the mail today from SeventhSphere on Etsy. It is now officially one of my favorite things! It is also of awesome quality, thickly lined, and, well, just splendid. Now you know that my obsessions do not only include things of wool and felt. I have momentarily branched out. Unfortunately, I think this particular duck egg fabric is now out of print. Although, I try not to think about that devastating news and focus on my new little jewel of a coin purse. 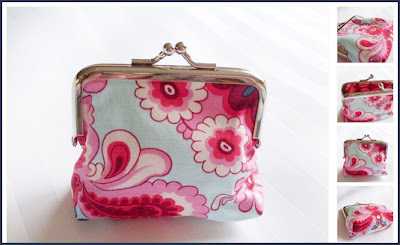 Super cute coin purse! Love the pattern too!